Humans have always taken their dominance over the Internet for granted. How short-sighted. Now, the greatest creation of human mind has gotten out of control and is now invading computers. And that is YOU who masterminded the threat! Try yourself as an evil genius in realistic and terrifying Computer Virus - Internet Worm Deluxe. Your ultimate goal is to get computers all over the world infected by your genius virus. Pick a mode first. INTERNET WORM mode is available right out of the box and there are 4 more for you to unlock. - EASY: Low level of antivirus software, few installations. - HARD: Highest level of antivirus prevention. All computers has antivirus and firewall, many Macs in the world. 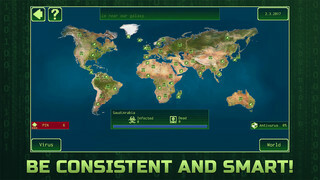 Pick a befitting name for your virus and welcome to the main screen, which is the world map. You can also see major indicators there, such as number of infected and hacked computers, relevant news, your current score and the like. The infection starts at a random spot, but then you can control it. Watch special tabs to track STATISTICS and VIRUS EXPANSION. 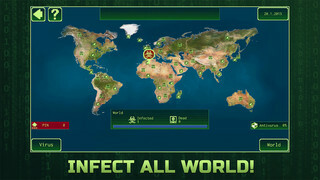 The infected areas turn red, watch your progress on the main screen and the tabs. - realistic graphics and convenient interface. 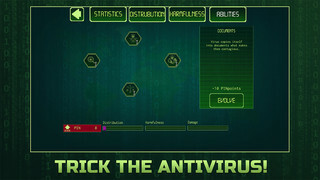 Explore the intricate mechanism of virus expansion, optimize your virus as you like, since Computer Virus - Internet Worm Deluxe provides vast range of opportunities for that. 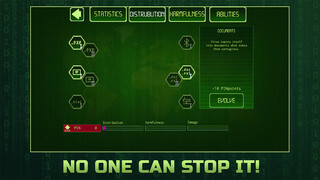 Unleash your inner evil genius and be the one to warn the humanity!